رضیئی, طیب. (1396). شناسایی رژیم های دمایی ایران با استفاده از روشهای چند متغیره. 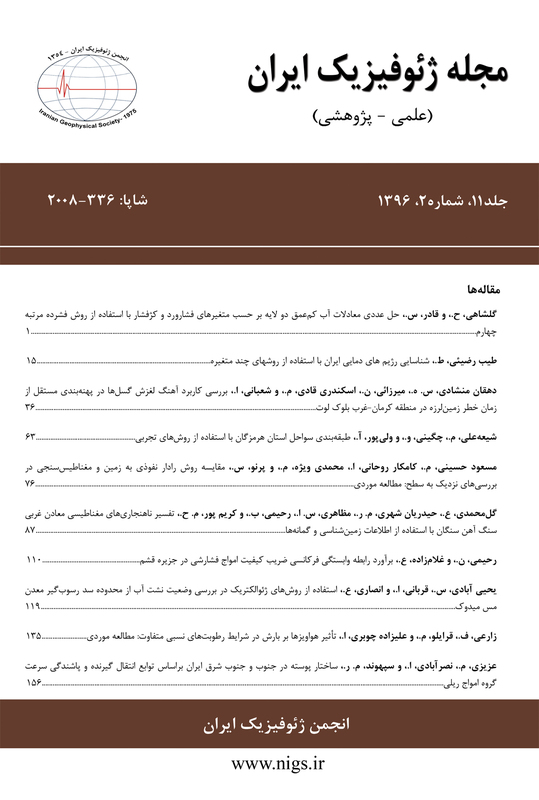 مجله ژئوفیزیک ایران, 11(2), 15-35. طیب رضیئی. "شناسایی رژیم های دمایی ایران با استفاده از روشهای چند متغیره". مجله ژئوفیزیک ایران, 11, 2, 1396, 15-35. رضیئی, طیب. (1396). 'شناسایی رژیم های دمایی ایران با استفاده از روشهای چند متغیره', مجله ژئوفیزیک ایران, 11(2), pp. 15-35. رضیئی, طیب. شناسایی رژیم های دمایی ایران با استفاده از روشهای چند متغیره. مجله ژئوفیزیک ایران, 1396; 11(2): 15-35. برای مدیریت بهینۀ منابع انرژی و تعین دقیق تقویم زراعی در مناطق مختلف کشور، شناسایی مناطق همگن از نظر رژیم‌ دمایی بسیار ضروری است. از این رو، به منظور شناسایی رژیم‌های دمایی ایران از داده‌های دمای ماهانۀ 155 ایستگاه همدیدی پراکنده در سطح کشور در دورۀ آماری 1990 تا 2014 استفاده شد. با انجام تحلیل مؤلفه‌های اصلی بر روی ماتریس میانگین دمای ماهانۀ ایستگاه‌های مورد استفاده، 3 مؤلفۀ اول برای مطالعۀ بیشتر انتخاب شدند. در مرحلۀ بعد با خوشه‌بندی به روش وارد بر روی ماتریس نمرۀ استاندارد مؤلفه‌های انتخابی، ایستگاه‌های مورد مطالعه به هفت منطقۀ همگن دمایی با عنوان رژیم ساحلی عمان، رژیم ساحلی خلیج فارس، رژیم ساحلی خزری، رژیم کوهستانی، رژیم کوهستانی مرتفع، رژیم دشتی و رژیم گرمسیری گروه‌بندی شدند. رژیم دمایی کوهستانی با تابستان‌های تقریباً خنک و زمستان‌های سرد منطقۀ کوهستانی غرب و شمال کشور و رژیم دمایی دشتی نیز مناطق کم‌ارتفاع مرکز و شرق ایران را در بر می‌گیرند. ایستگاه‌های بسیار مرتفع مناطق کوهستانی کشور نیز در رژیم کوهستانی مرتفع خوشه‌بندی شدند که در مقایسه با رژیم دمایی کوهستانی، زمستان‌های سردتر و تابستان‌های خنک‌تری دارد. رژیم دمایی گرمسیری نیز به‌عنوان گرم‌ترین رژیم دمایی کشور، جنوب غرب و بخشی از جنوب ایران را در بر می‌گیرد. ایستگاه‌های کرانه‌های ساحلی دریای خزر در شمال و دریای عمان و خلیج‌فارس در جنوب کشور نیز به ترتیب با رژیم دمایی ساحلی خزری، رژیم ساحلی دریای عمان و رژیم ساحلی خلیج فارس مشخص می‌شود که در مقایسه با دیگر رژیم‌های دمایی ایران از اعتدال دمایی بیشتری در طی سال برخوردارند . نقش ناهمواری‌ها، عرض جغرافیایی و منابع آبی دریای خزر، دریای عمان و خلیج فارس در شکل‌گیری رژیم‌های دمایی به‌خوبی دیده می‌شود. رژیم‌های دمایی به‌دست‌آمده می‌تواند به مدیریت بهتر منابع انرژی، توسعۀ برنامه‌های گردشگری، تعیین دقیق‌تر تقویم زراعی مناطق مختلف کشور و نیز شناسایی گیاهان مناسب برای کاشت در آن‌ها کمک کند. Identification of temperature regimes is very crucial for a better management of energy resources, recreations and truisms as well as for adequately determining agricultural calendars in different parts of the country. Few attempts have been made to adumbrate the Iranian temperature regimes; thus it is necessary to identify the most realistic temperature regimes of Iran using as many available stations across the country as possible. For this purposes, 155 Iranian synoptic stations with a relatively regular distribution across the country, mostly having full data records for the common period of 1990 to 2014, were used for the identification of the temperature regimes. In all stations, the average of the mean monthly temperature was computed in the mentioned period and further employed for the analysis. A principal Component Analysis (PCA) was applied to the inter-stations correlations matrix (155×12) composed of 155 stations and 12 mean monthly temperature values for each station. The computed Kaiser-Meyer-Olkin (KMO) measure of the sampling adequacy indicated that the matrix with the KMO value of 0.87 is useful for a PCA application. The first three leading PCs were considered for further analysis based on the scree plot and the sampling errors of the PCs (North et al., 1982). The remaining PCs were then rotated using varimax orthogonal criterion. The PC scores of both rotated and un-rotated solutions were separately used as inputs for Cluster Analysis (CA) to partition the considered stations into distinctive clusters. Moreover, all agglomerative CA methods as well as K-means CA were examined so as to find out the most appropriate method for partitioning the data. The cophenetic correlation coefficient was employed to measure how well the hierarchical dendrogram of a given CA represents the relationships within the input data. The results indicated that all the clustering approaches properly represented the inherent structure of the input data, yet the Ward method was selected as the most appropriate method since it resulted in much realistic clusters that quite perfectly matched the topographic and geographical features of the country. The correct number of clusters was also selected based on the Silhouette index (Rousseeuw, 1987) that measures how well objects lie within their cluster, and which ones are merely somewhere in between the clusters. The average silhouette width provides an evaluation of clustering validity, and might be used to select an ‘appropriate’ number of clusters. Computing the index for a set of predefined cluster numbers (2 to 15 clusters), it was observed that six is the most appropriate number for clusters for a better representation of the inherent structure of the data. As such, all 155 stations were classified into six clusters applying Ward CA method on the three leading un-rotated PC scores. The maps of varimax rotated PC scores properly represented areas characterized with seasonal temperature variability. The first and second varimax rotated PC sores respectively display the winter and summer temperature variability across the country. Applying Ward clustering on un-rotated PC scores resulted in seven distinct clusters that appropriately specified the Iranian temperature regimes. It was found that the western and northern mountainous areas have a mountainous temperature regime whereas the central-eastern Iran hosting the Iranian deserts has a plain temperature regime which is considerably warmer than the earlier one. The third temperature regime includes stations scattered across the mountainous region, all of which are characterized with a very high elevation, hence having the coldest winters and the coolest summers in the country. The hot temperature regime which is the warmest temperature regime in the country belonged to the southwest and certain parts of the south. The stations located in the coastal areas of the northern and southern Iran respectively have the Caspian coastal, Persian Gulf coastal and Oman Sea coastal temperature regimes, all with the lowest annual temperature ranges in the country. Four out of the seven Iranian temperature regimes are continental but the ‌two mountainous temperature regimes are the most continental regimes in the country due to their wider temperature ranges. The results conduce to a better management of energy resources, recreations and tourisms as well as an optimal determination of agricultural calendars in different parts of the country. اسدی، ا.، و مسعودیان، س. ا.، 1393، پهنه‌بندی ایران بر پایه دماهای فرین بالا: فیزیک زمین و فضا، 40(4)، 168-155. اکبری، ط.، و مسعودیان، س. ا.، 1388، شناسایی رژیم دمایی و پهنه‌بندی نواحی دمایی ایران: جغرافیا و برنامه ریزی محیطی، 33(1)، 74-59. جهانبخش‌اصل، س.، و ذوالفقاری، ح.، 1381، بررسی الگوهای همدیدیدی بارش‌های روزانه در غرب ایران: فصلنامه تحقیقات جغرافیایی، شماره پیاپی 63 و 64، 234-258. خسروی، م.، دوستکامیان، م.، میرموسوی، ح.، بیات، ع.، و بیگ‌رضایی، ا.، 1393، طبقه‌بندی دما و بارش در ایران‌زمین با استفاده از روش‌های زمین‌آمار و تحلیل خوشه‌ای: فصلنامه برنامه‌ریزی منطقه‌ای، سال چهارم، 13، 121-132. ذوالفقاری ، ح.، و ساری‌صراف، ب.، 1378، بررسی بارش‌های شمال غرب ایران با تاکید بر تحلیل خوشه ای: آب و توسعه، 7(2و3)، 134-142. غیور، ح. ع.، و منتظری، م.، 1383، پهنه‌بندی رژیم‌های دمایی ایران با مؤلفه‌های مبنا و تحلیل خوشه‌ای: جغرافیا و توسعه، پائیز و زمستان، 34-21. مسعودیان، ا.، 1384، شناسایی رژیم‌های بارش ایران به روش تحلیل خوشه‌ای: پژوهش‌های جغرافیایی، 52، 47-59. مسعودیان، ا.، و دارند، م.، 1389، شناسایی و پهنه‌بندی نواحی دمای فرین سرد ایران: مطالعات جغرافیایی مناطق خشک، 1(2)، 43-54. مسعودیان، ا.، و عطایی، ه، 1384، شناسایی فصول بارشی ایران به روش تحلیل خوشه ای: مجله پژوهشی دانشگاه اصفهان (علوم انسانی)، 18(1)، 1-12. مسعودیان، س. ا.، زینالی، ح.، و حجتی‌زاده، ر.، 1387، نواحی دمایی ایران: فصلنامه تحقیقات جغرافیایی، 89، 184-171. Bunkers, M. J., Miller, J. R., and DeGaetano, A. T., 1996, Definition of climate regions in the Northern plains using and objective cluster modification technique: Journal of Climate, 9, 130-146. Comrie, A. C., and Glenn, E. C., 1998, Principal components-based regionalization of precipitation regimes across the southwest United States and northern Mexico, with an application to monsoon precipitation variability: Climate Research, 10, 201-215. Domroes, M., Kaviani, M., and Schaefer, D., 1998, An Analysis of Regional and Intra-annual Precipitation Variability over Iran using Multivariate Statistical Methods: Theoretical and Applied Climatology, 61, 151-159. Ehrendorfer, M., 1987, A regionalisation of Austria’s precipitation climate using principal component analysis: Journal of Climate, 7, 71–89. El Kenawy, A., López-Moreno, J. I., and Vicente-Serrano, S. M., 2013, Summer temperature extremes in northeastern Spain: spatial regionalization and links to atmospheric circulation (1960–2006): Theoretical and Applied Climatology, 113, 387–405. Fernández Mills, G., 1995, Principal Component Analysis of precipitation and rainfall regionalization in Spain: Theoretical and Applied Climatology, 50(3), 169-183. Fovel, R. G., and Fovel, M. C., 1993, Climate zones of coterminous United States defined using cluster analysis: Journal of Climate, 6, 2103-2135. Green, M. C., Flocchini, G., and Myrup, L. O., 1993, Use of temporal principal components analysis to determine seasonal periods: Journal of Applied Meteorology, 32(5), 986-995. Janowalk J. E., 1988, An Investigation of interannual rainfall variability in Africa: Journal of Climate, 1, 240-255. Jones, D. A., 1999, Characteristics of Australian land surface temperature variability: Theoretical and Applied Climatology, 63, 11-31. Kansakar, S. R., Hannah, D. M., Gerrard, A. J., and Rees, G., 2004, Spatial pattern in the precipitation regime of Nepal: International Journal of Climatology, 24, 1645–1659. Mildrexler, D. J., Maosheng, Z., and Running, S. W., 2011, Satellite Finds Highest Land Skin Temperatures on Earth: Bulletin of the American Meteorological Society, 92(7), 855-860. Modarres, R., 2006, Regional precipitation climates of Iran: Journal of Hydrology (NZ), 45(1): 15-29. Modarres, R., and Sarhadi, A., 2011, Statistically-based regionalization of rainfall climates of Iran: Global and Planetary Change, 75, 67–75. North, G. R., Bell, T. L., and Cahalan, R. F., 1982, Sampling errors in the estimation of empirical orthogonal functions: Monthly Weather Review, 110, 699–706. Rao, A. R., and Srinivas V. V., 2006, Regionalization of watersheds by hybrid-cluster analysis: Journal of Hydrology, 318, 37–56. Raziei, T., Bordi I., and Pereira, L. S., 2008, A precipitation-based regionalization for Western Iran and regional drought variability: Hydrology and Earth System Sciences (HESS), 12, 1309–1321. Richman M.B., 1981, Obliquely rotated principal components: An improved meteorological map typing technique: Journal of Applied Meteorology, 20, 1145-1159. Richman, M. B., 1986, Rotation of principal components: Journal of Climatology, 6, 293-335. Rousseeuw, P. J., 1987, Silhouettes: A graphical aid to the interpretation and validation of cluster analysis: Journal of Computational and Applied Mathematics, 20, 53-65. Saraçli, S., Doğan, N., and Doğan, I., 2013, Comparison of hierarchical cluster analysis methods by cophenetic correlation: Journal of Inequalities and Applications, 2013:203. Saris, F., Hannah, D.M., Eastwood, W. J., 2010, Spatial variability of precipitation regimes over Turkey: Hydrological Sciences Journal, 55(2), 234-249. Sarmadi, F., and Azmi, M., 2015, Regionalizing mean air temperature in Iran by multivariate analysis and L-moment methods, Journal of Hydrologic Engineering, DOI: 10.1061/(ASCE) HE. 1943-5584.0001280. Sheskin, D., 2007, Handbook of Parametric and Nonparametric Statistical Procedures, Chapman & Hall/CRC, 1736 pp. Singh, K. K., and Singh, S. K., 1996, Space-time variation and regionalization of seasonal and monthly summer monsoon rainfall of the sub-Himalayan region and Gangetic plains of India: Climate Research, 6, 251-262. Todhunter, P. E., Mearns, L. O., Terjung, W. H., Hayes, J. T., and Ji, H. Y., 1989, Effects of Mosoonal fluctuations on Grains in China. Part I, Climatic conditions for 1961-1975: Journal of Climate, 2, 5-17. Unal, Y., Kindap, T., and Karaca, M., 2003, Redefining the climate zones of Turkey using cluster analysis: International Journal of Climatology, 23(9), 1045–1055. Yarnal, B., 1993, Synoptic Climatology in Environmental Analysis: A primer, Belhaven Press, London, UK.